If you haven't stopped by Cartunno Couture, then you are missing out on some fun, fashionable, and down right elegant clothes. Check out their store on the Galaxy and their new main updated store too. 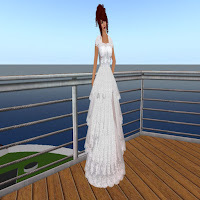 This gown is from the Titanic group, the dress is called The Heaven Gown. One can see why, with the elegance and lace of this gown it could be worn as a bridal gown, or for some romantic dances in a ballroom. This is going to be a valuable addition to my gown collection.